Home > Departments > The Fenway Experience > What Makes Fenway Fenway? Fenway Park is a shrine. People go there to worship. Sure, you can watch baseball anywhere - in a Little League park, on TV in your living room, even in a retractable-roof dome. But what makes the Fenway experience so unique? Deep center field: 420 ft. Seeing a hitter drive a pitch half-way up the "Green Monster" just to be held to a long single; watching a runner head for third while his ball bounces around in "the triangle"; seeing a player wrap a pitch around "Pesky's Pole" for a 305-foot home run... These are all experiences that can only be had at Fenway. Whether you're emerging from the T at Kenmore Square or driving in your car on Storrow Drive, that first view of the Citgo sign signals your proximity to Fenway. During the game, its blinking lights are as much a fixture as the Fenway Frank. When I lived outside New England, driving by a Citgo station always brought a smile to my face and reminded me of home. It all began in 1940, when Cities Service erected a sign over their divisional offices building. The Citgo sign as we know it today was installed in 1965. The 60-foot-by-60-foot sign is made up of 5,878 glass tubes totaling more than five miles' worth of neon. 250 high-voltage transformers light the sign from dusk till midnight every night. When the sign's lights were turned off in 1979 to save energy, Sox fans rallied, asking that the sign be declared a Boston landmark. While it never achieved official landmark status (because the city of Boston would be financially responsible for maintaining it rather than the Citgo company), the public outcry was so great when Citgo tried to remove the sign a few years later, that the company agreed to leave it in place and turn the lights back on. 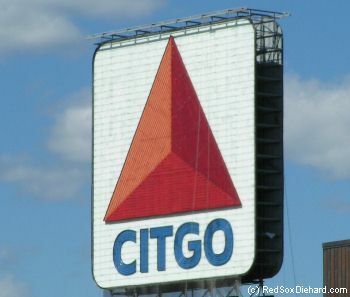 For all the facts and statistics, as well as info on the Keeper of the Sign, please visit Citgo's page on the Boston Sign.